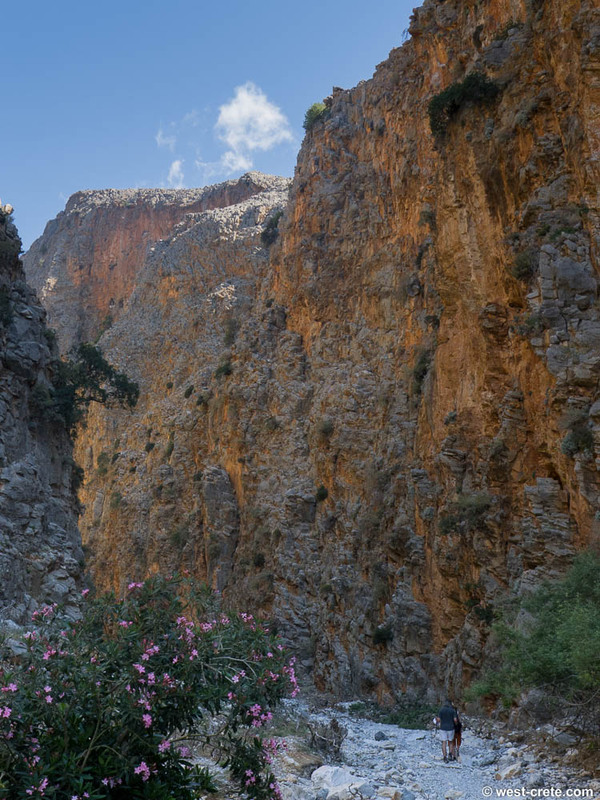 The gorge of Aradena is located in the region of Sfakia. 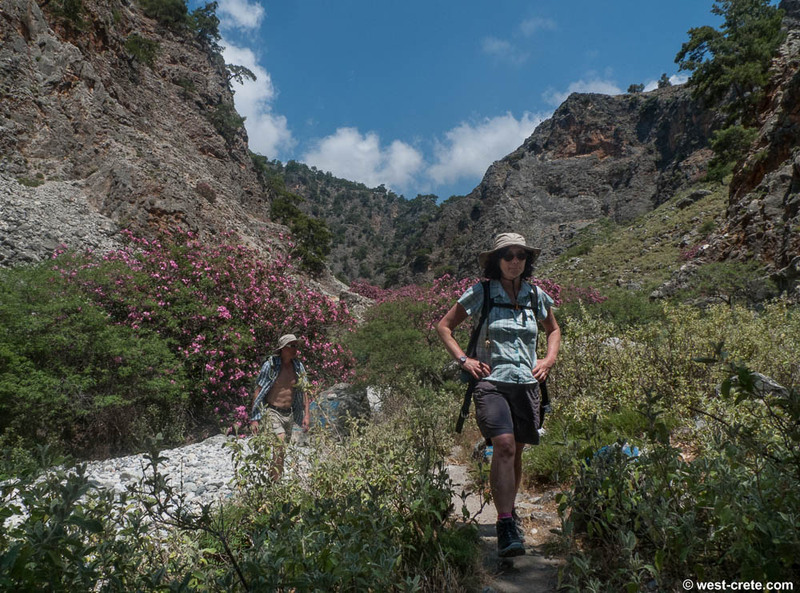 It runs from the southern slopes of the White Mountains and forms a deep cut to the small beach of Marmara (a little to the West of Loutro). 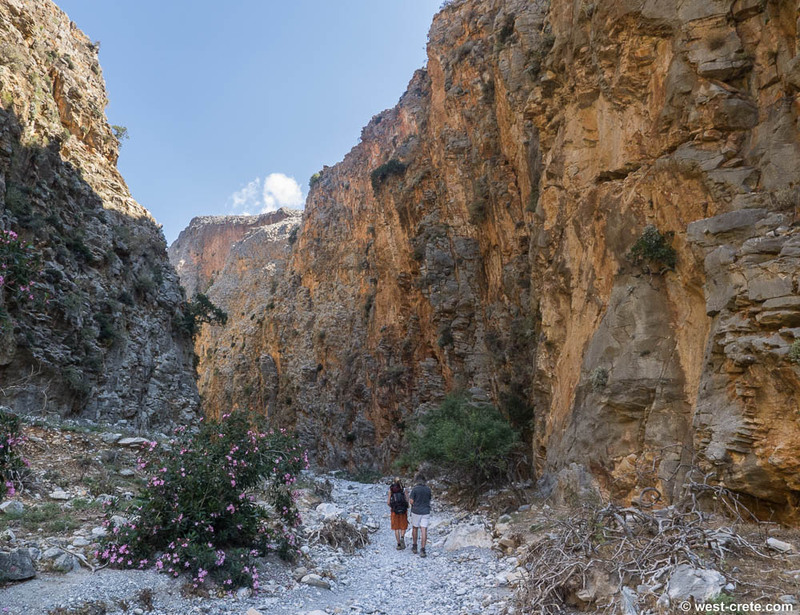 It is one of the more popular gorge walks in western Crete so you won't be entirely on your own but it is much quieter than Samaria, Imbros or Agia Irini. 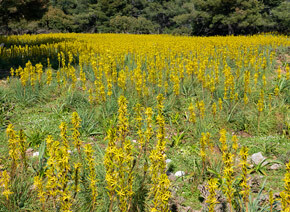 Even though the walk is not that long (2½ to 3 hours of walking time for the Aradena village to Marmara section or vice versa) it is a little more difficult than some of the better known gorges and it is not recommended for people without any walking experience: many passages require a good deal of sure-footedness (especially if you are walking downwards) and a head for heights. 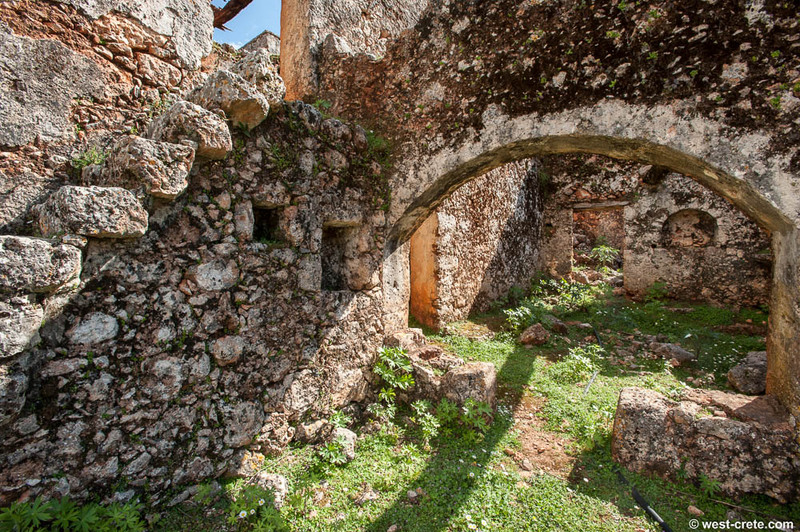 The village of Aradena which was abandoned in the 1950s is also well worth a visit and will give you a good idea of traditional Cretan architecture. You can see photos of the houses here. 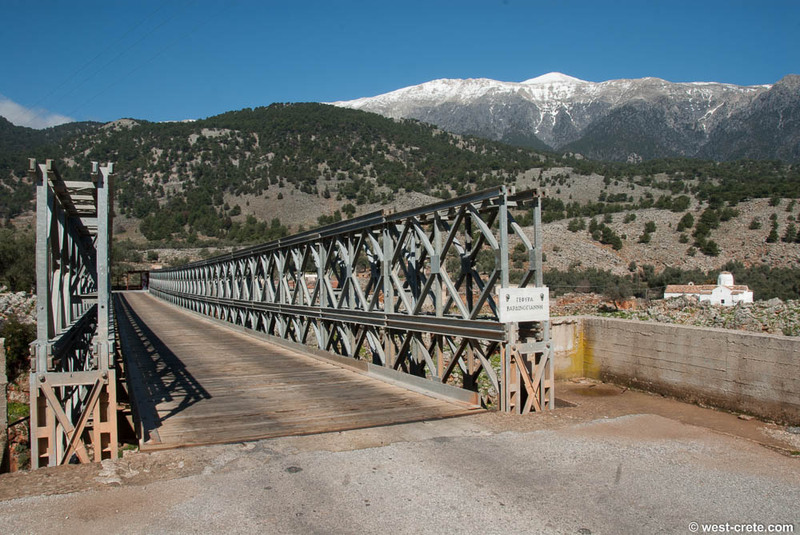 Since 1986 the village has been connected by road to Anopolis and the rest of the road network via a spectacular Bailey bridge that spans the deep gorge. 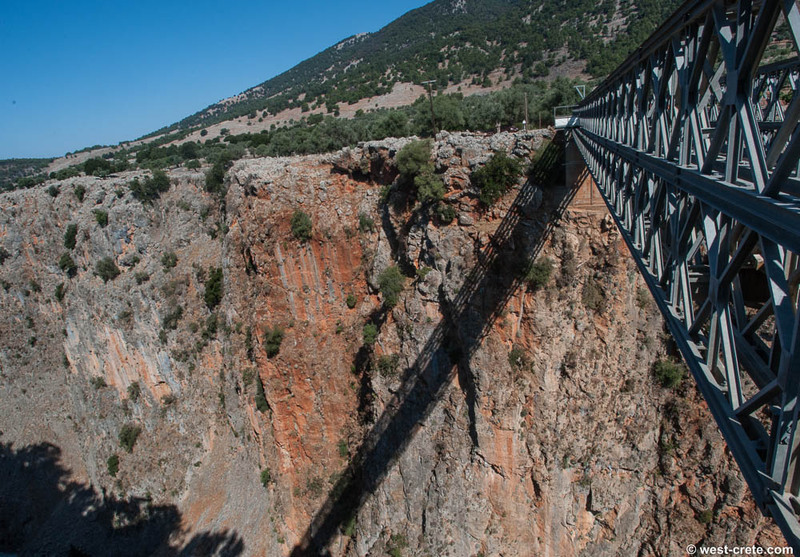 Note the platform in the middle of the bridge: it is used for bungee jumping (generally at weekends during the summer months). 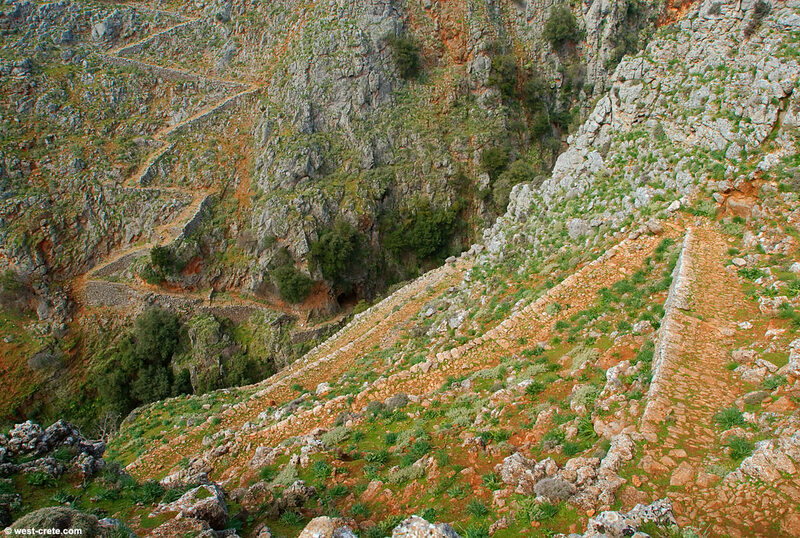 The old stone path crossing the gorge at Aradena (one of several ancient paths crossing the gorge) is a spectacular example of traditional kalderimia (cobbled mule tracks). 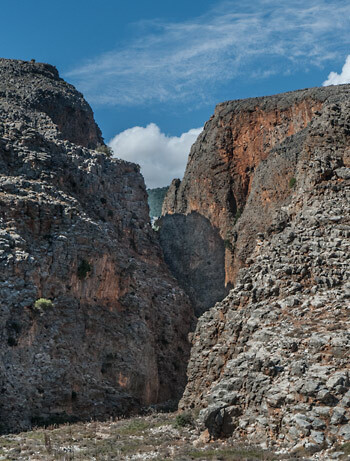 This is what you will follow to get yourself into (or out) of the gorge. 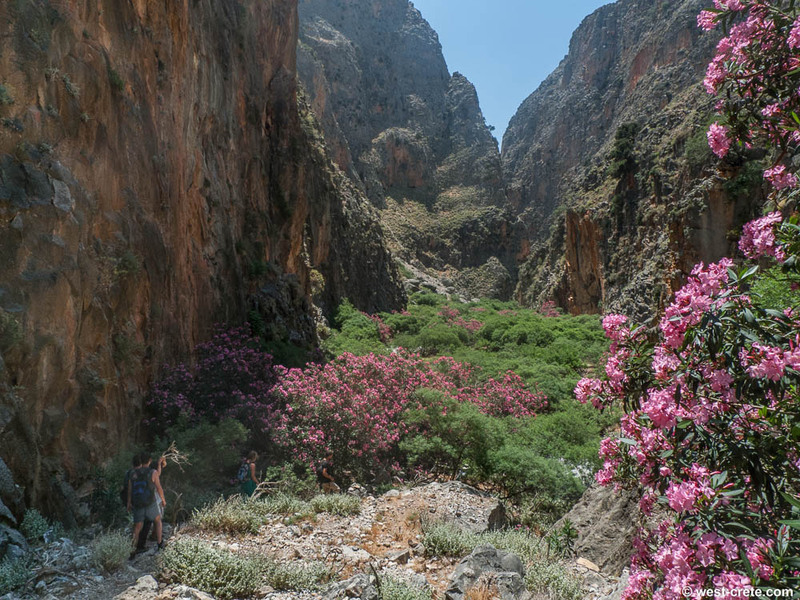 The gorge of Aradena is very rich in chasmophyte (cliff dwelling) flowers, many of them endemic to Crete and some quite rare. 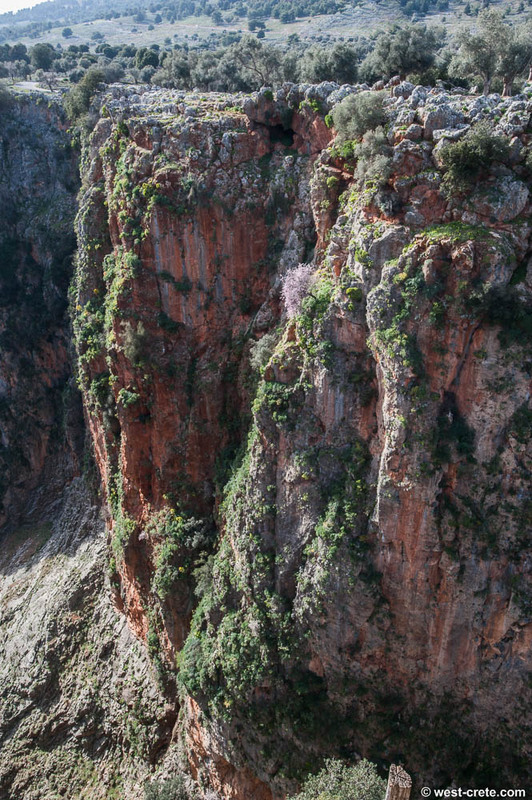 Several pairs of griffon vultures nest in the cliffs of the gorge and you will generally see them fly above you. 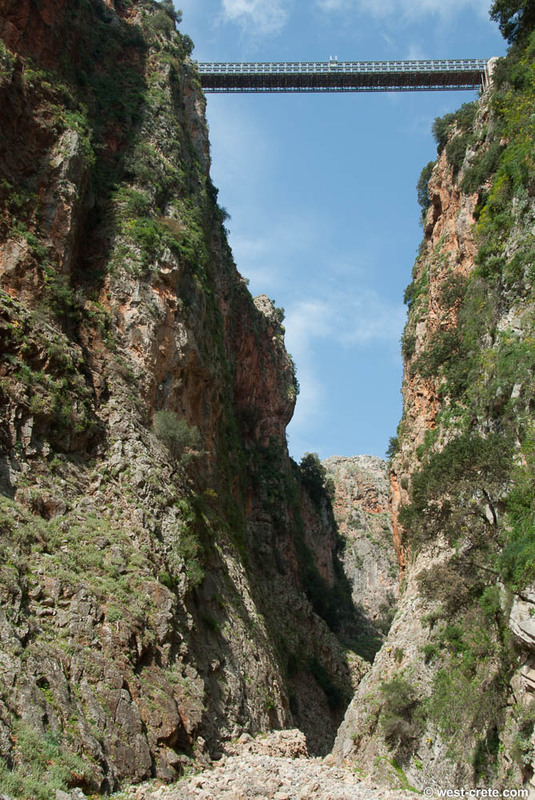 The gorge used to be considered difficult because of a passage which had to be negotiated with a rope. 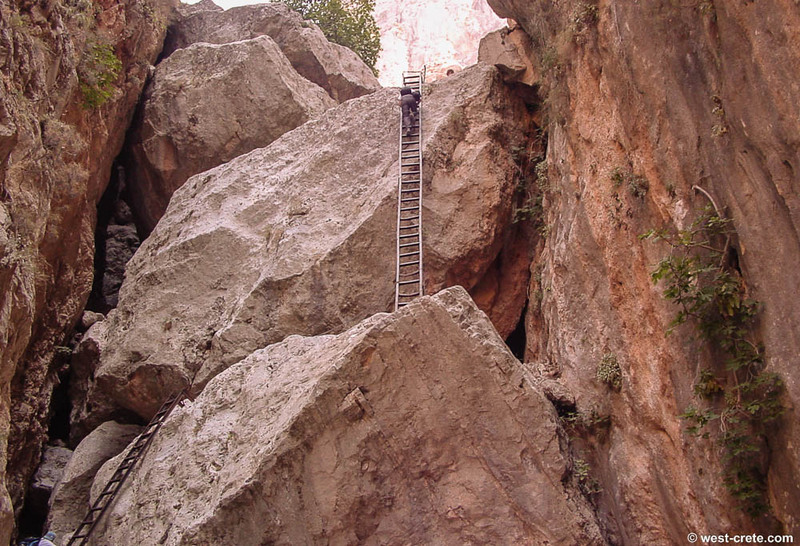 About 20 years ago a solid metal ladder was attached to the rock face instead of the rope, making the passage easy - as long as you do not suffer from fear of heights (it is a little over 10m in height). Later on (around 2004?) a path was built which avoided the ladders and made it a little bit more comfortable for people with fear of heights (it's still exposed though). Unfortunately the path has not been maintained and some parts have become slippery and the handrail is loose or missing in places. 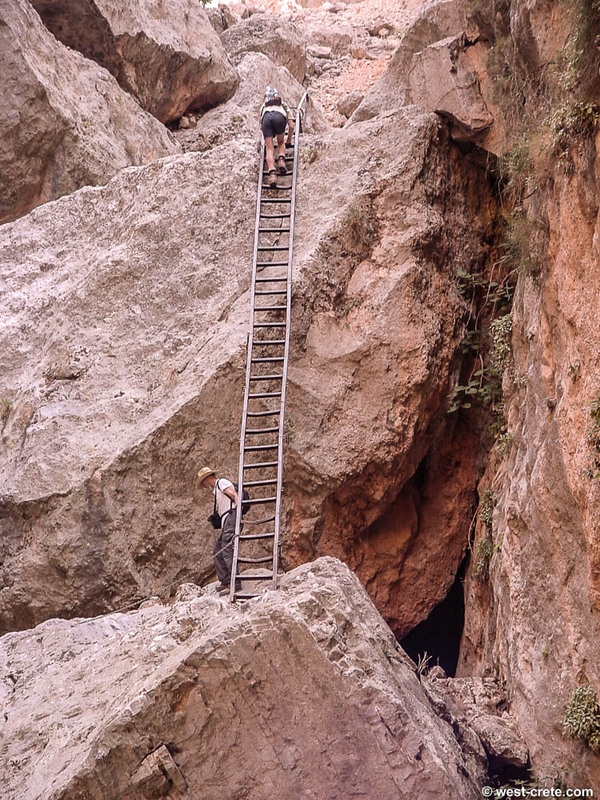 Because the path with the ladders has not been used much (or maintained) it has become unsafe as well (the ladders themselves are fine, solidly built and safely anchored but some parts above them are slippery). So slowly we are heading for a dangerous situation unless the "new" path is fixed soon. 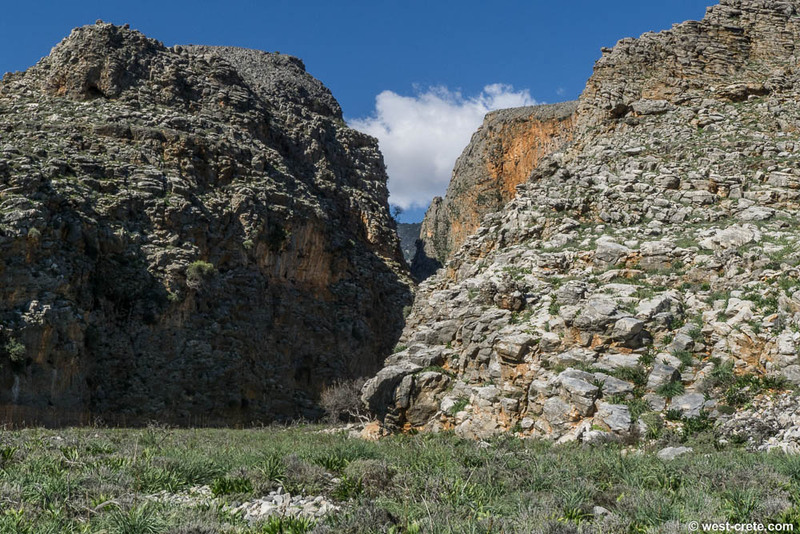 The walk through the gorge of Aradena is easier going upwards, starting at the beach of Marmara and heading to the abandoned village of Aradena. There are several slightly tricky passages that require less experience and concentration going up than going down. 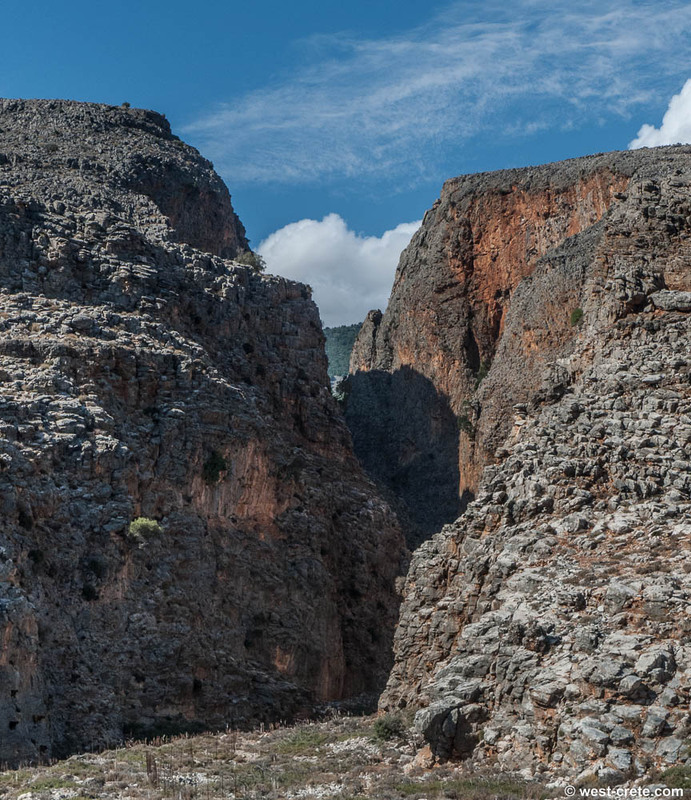 The fact that you are walking up from sea level to a height of about 600m is not very noticeable because the climb is spread over the length of the gorge. You cannot miss the start of the gorge. Just walk up following the path in the river bed. The beginning of the walk is between high cliffs so you will get plenty of shade unless it's the middle of the day. 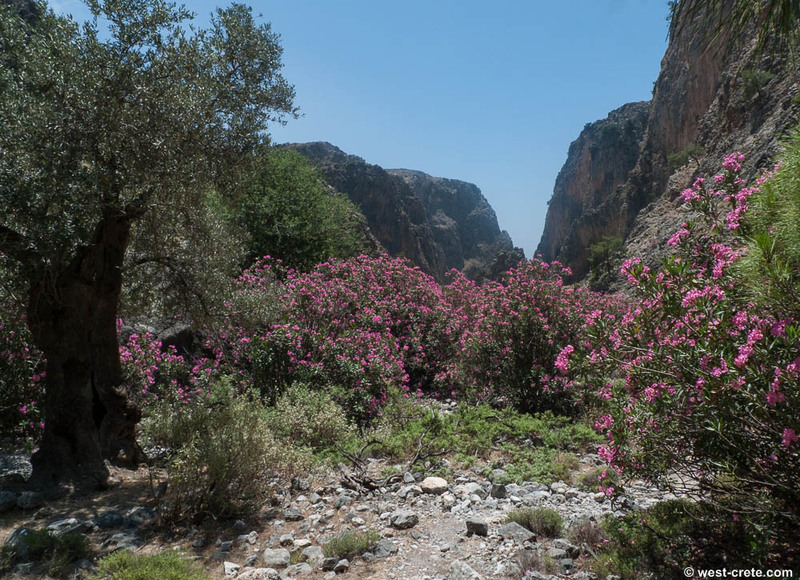 There are a lot of oleander bushes (they flower from May to July) in the river bed. 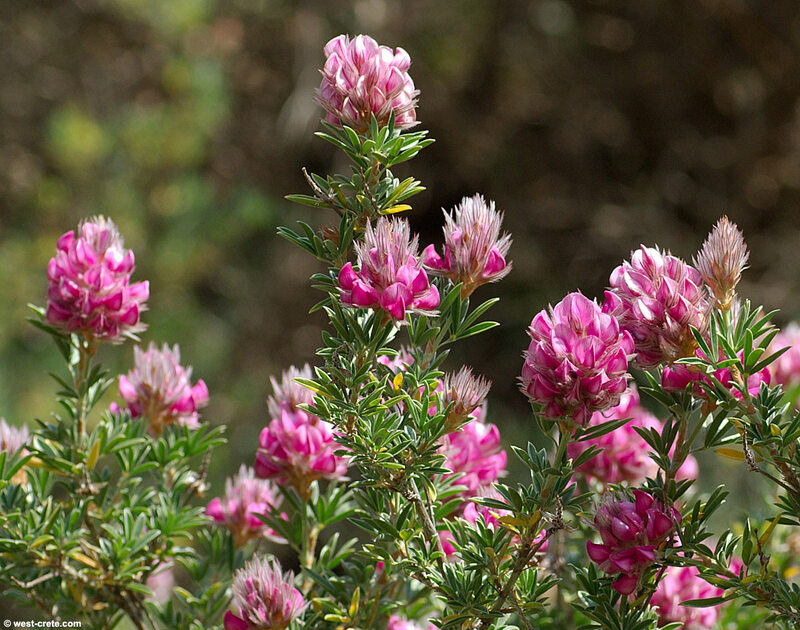 Avoid touching them, they are poisonous and some people will develop allergic reactions from simple skin contact. 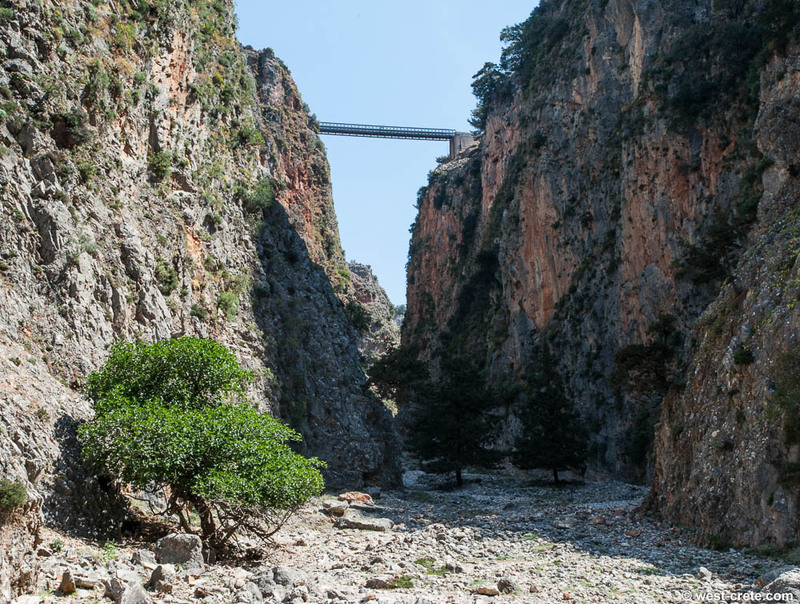 After about 30 minutes walk, the gorge widens a little and you will come to a large olive tree and see a sign pointing to the right with Taverna Livaniana written on it. 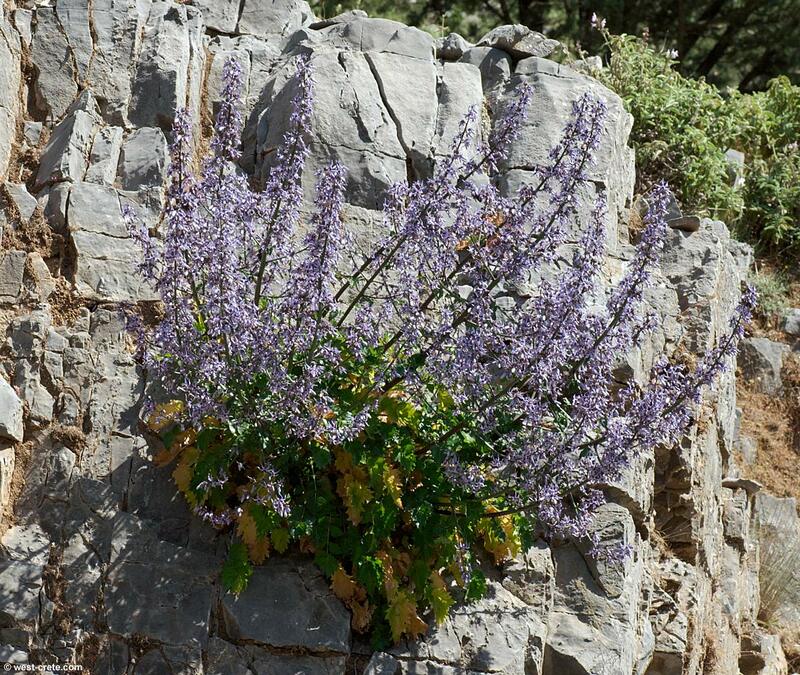 This path takes you up to the village of Livaniana. 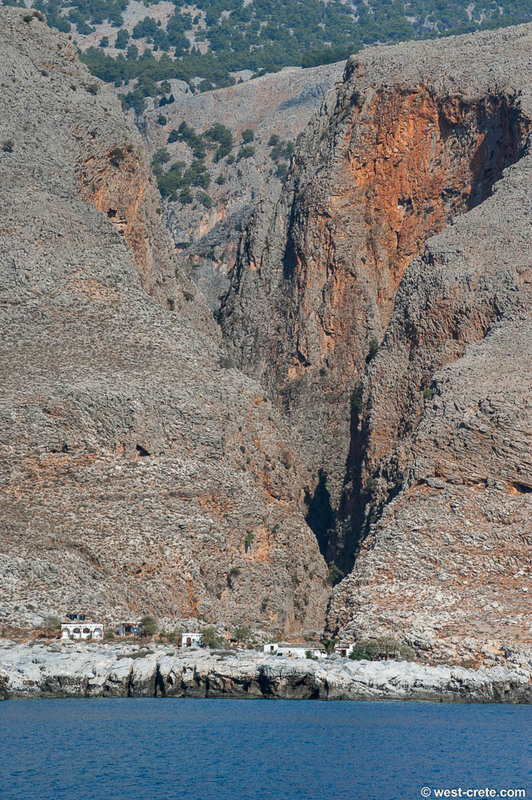 This is an alternative if you just want a short walk through the gorge. 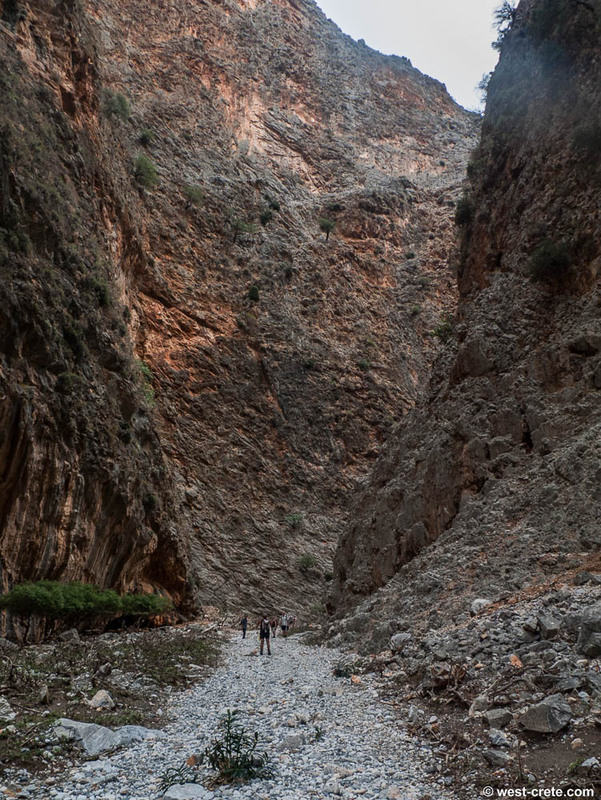 Otherwise keep going straight up the gorge. The path is marked with stone cairns and with spots of colour paint. Pay attention to them because there are several places where you might take the wrong route. You would not get lost but might make it a little bit more difficult. In a few spots there are two paths that have been marked. Don't panic, in this case both routes are OK. The walk through Aradena is a little like walking up a staircase with very wide steps: you walk for a while on almost flat ground, then get to a short steep part then flat again and on like this. 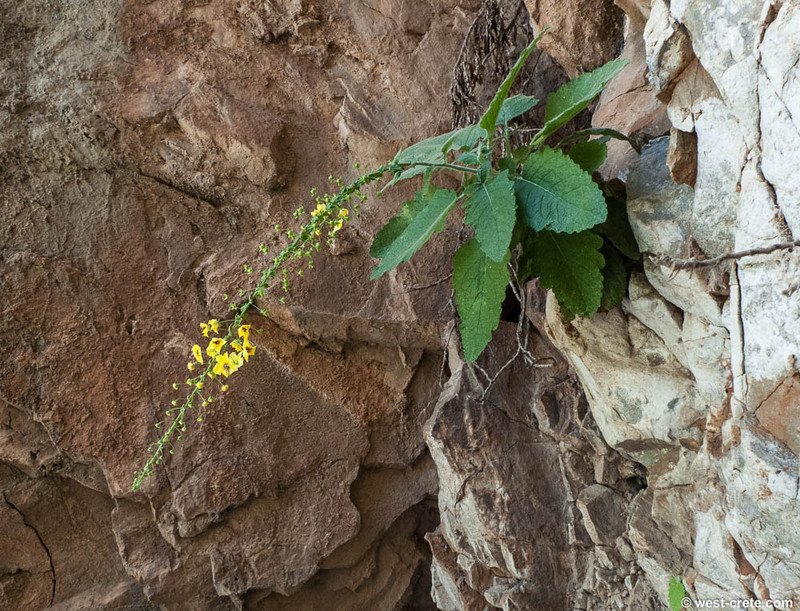 There are seven steep passages. These are the parts where you are better off walking up. 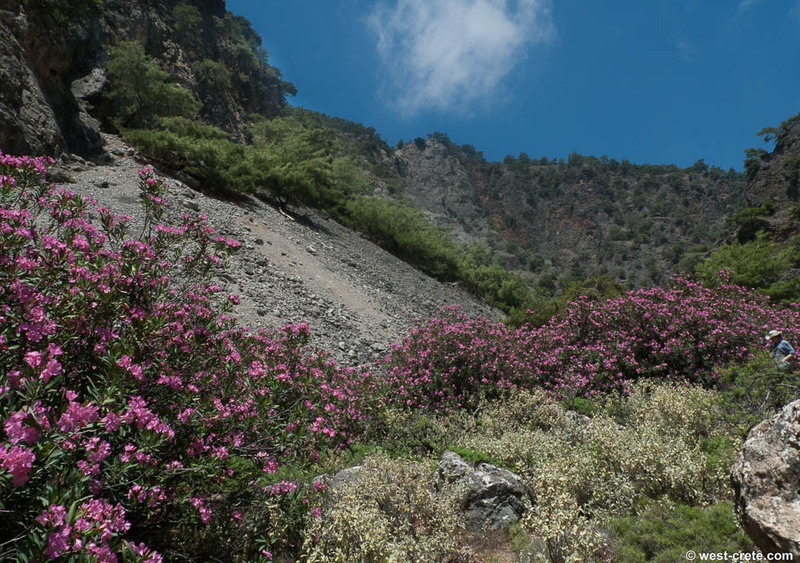 At the second steep place, in the middle of large oleander bushes there is a small spring, a little hidden from the path. This is the only water place in the gorge. 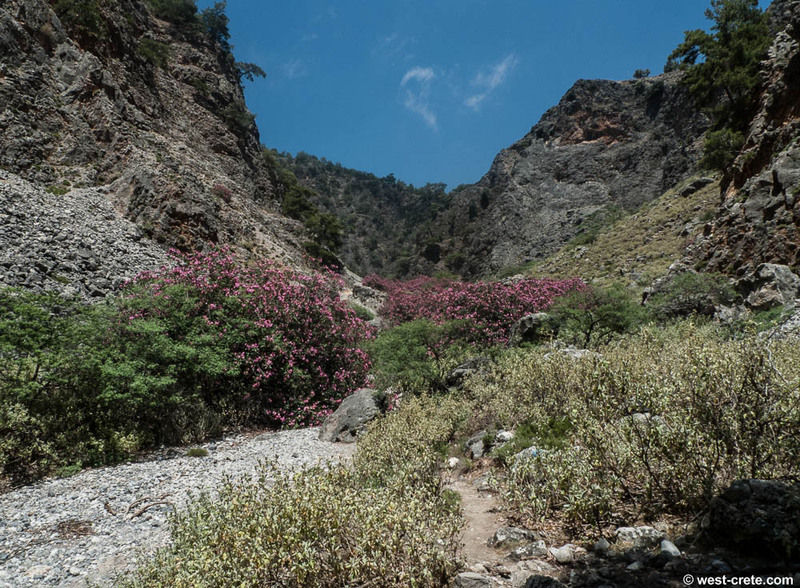 This spring is really easy to miss (there are two paths that are marked with dots and one of them does not pass near the spring) so do not rely on it for water and make sure that you carry enough for the whole walk. 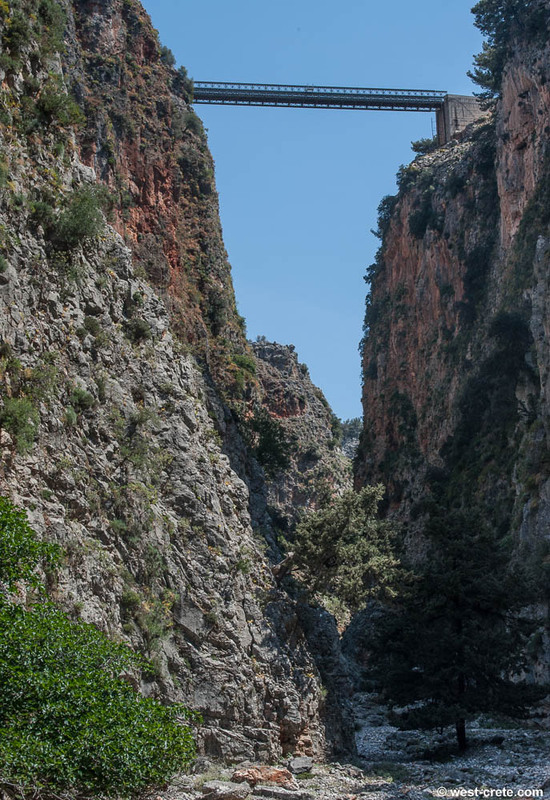 After about one and a half to two hours you will arrive at a kind of fence across the gorge and have to turn left and start climbing a path which was built to avoid the famous (or infamous) ladders. 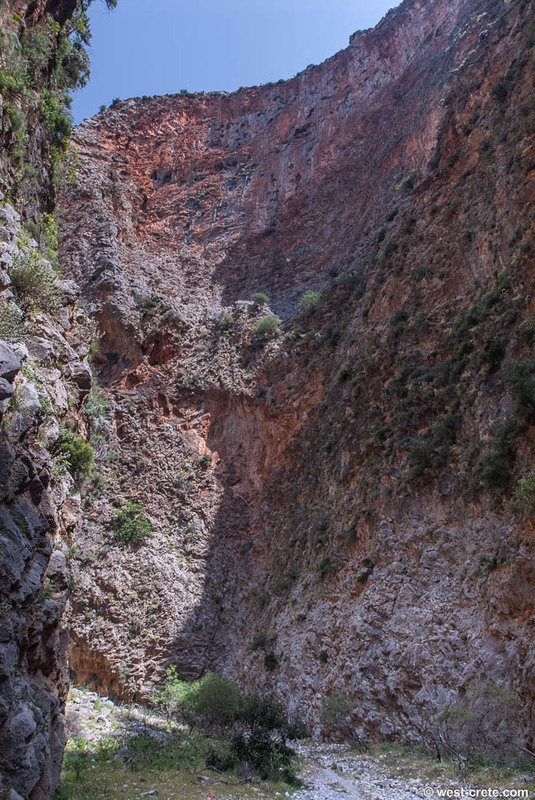 The path climbs up into the western side of the cliff and descends again into the gorge. 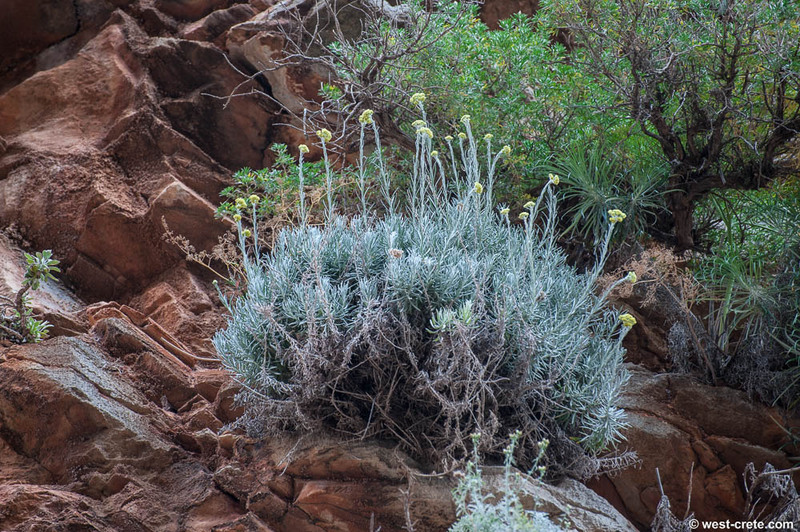 The path is well built and reasonably wide but you still need a little head for heights as it goes into the side of the cliff. Note that there has been almost no maintenance on this part of the path for a long time and parts of it are badly eroded and slippery. Some of the wooden railings have gone and others are not stable anymore. 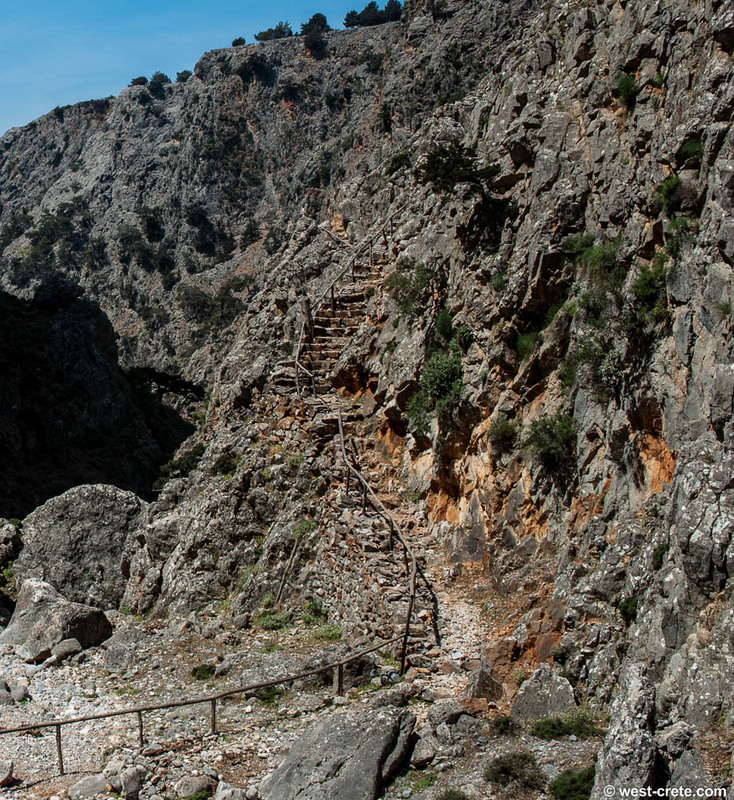 If you want to go the old way continue in the gorge and you will arrive at the metal ladders within a couple of minutes. The higher one moves a little when you are on it but don't worry, it is really solid. After the ladder keep climbing up until you rejoin the other path. Note that because this path has been disused parts of it above the ladders are slippery and eroded and not very safe. 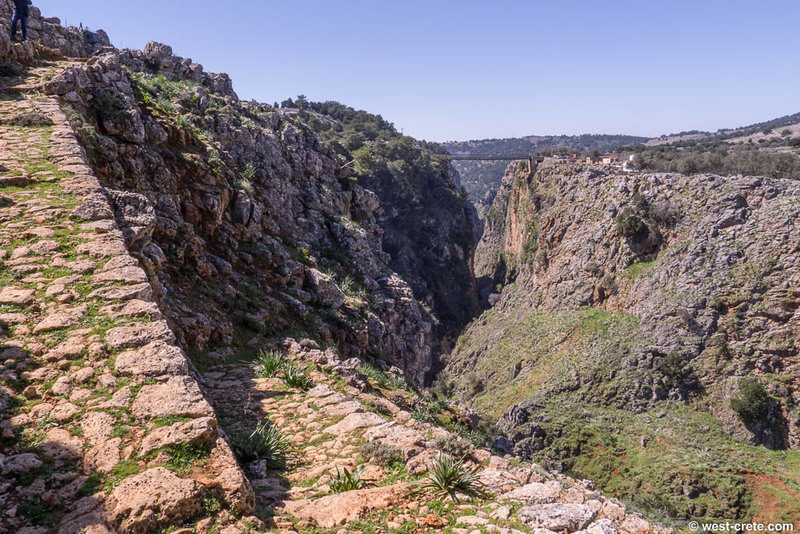 Soon after this passage you can see the bridge which leads from Anopolis to Aradena high above you. You need to pass under the bridge (where you will often encounter rubbish and assorted nasties) and keep walking for another 10 minutes up the river bed. 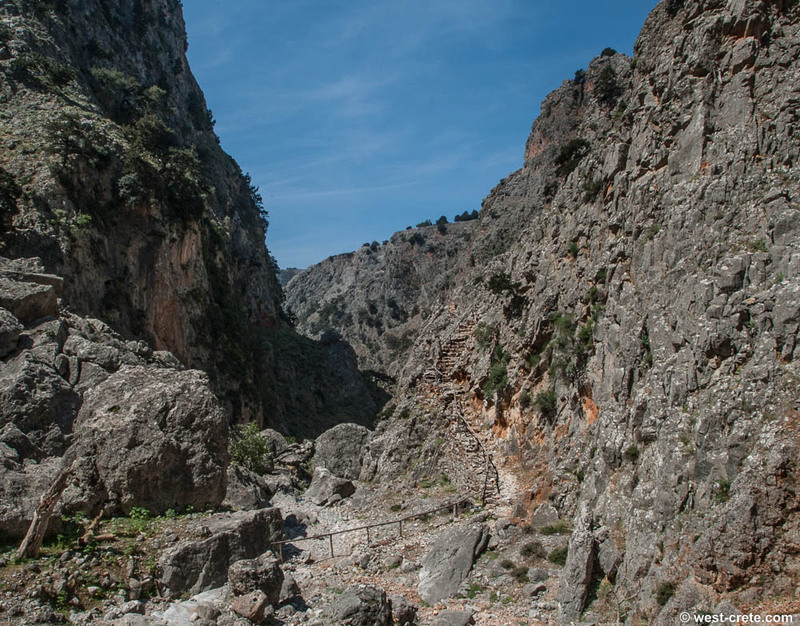 You then get to the very good path leading out of the gorge. 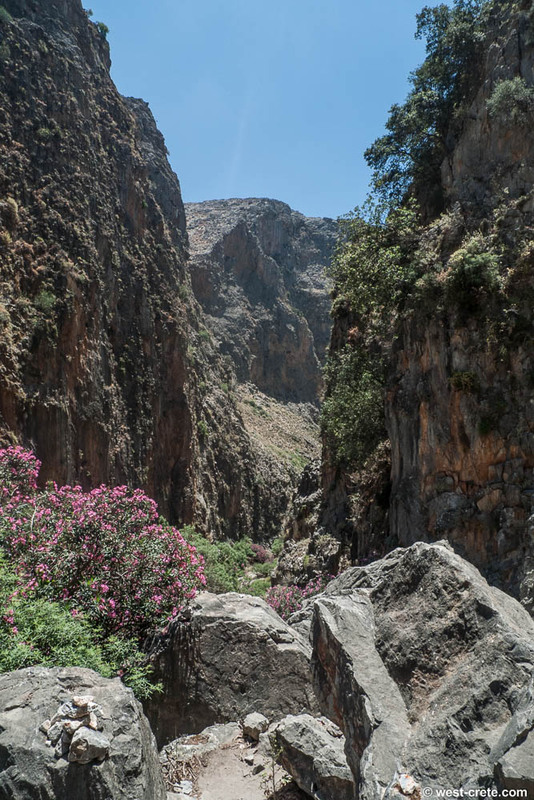 If you go to your left it takes you to the village of Aradena, if you take the one leading up to the right (it starts about 40m further up the river bed) it takes you out on the other side of the gorge towards the village of Anopolis. 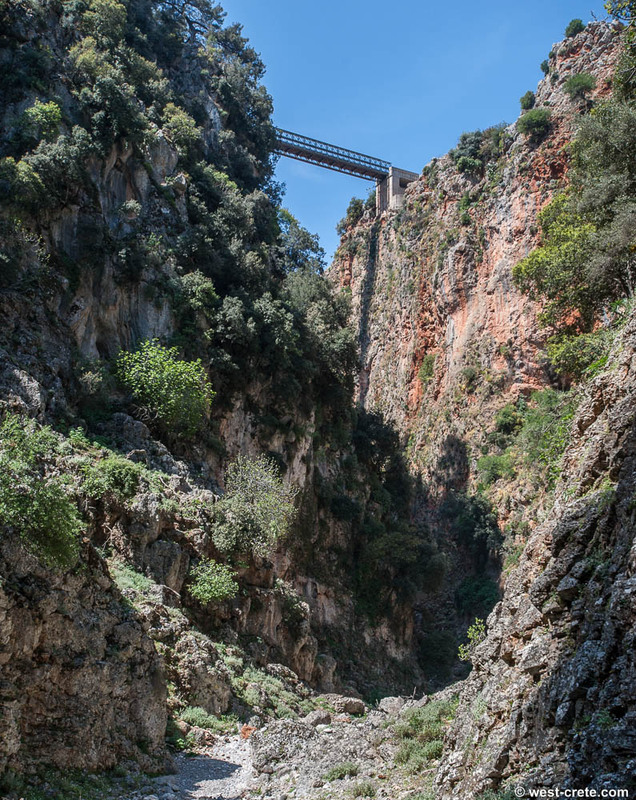 You can enter the gorge from either side of it by following the excellent paved path that was built centuries ago to cross the gorge. 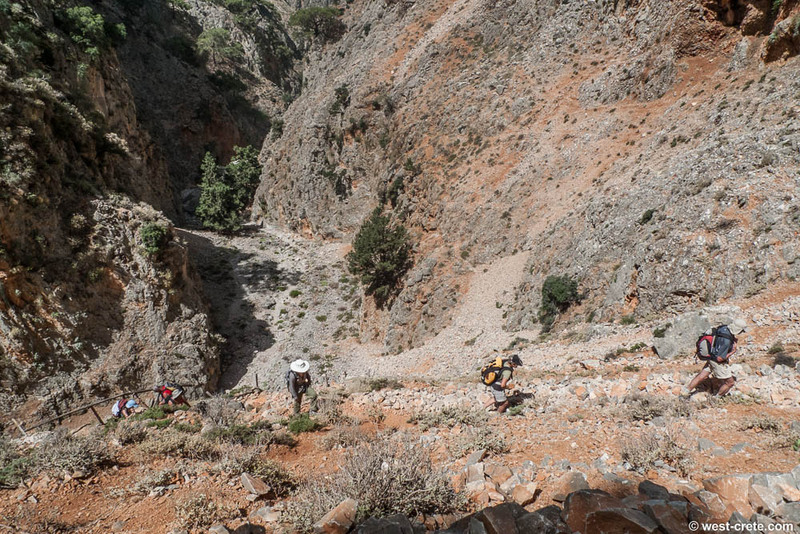 The walk down through the gorge takes about the same amount of time as the walk up and requires a little bit more care to negotiate several steep descents. 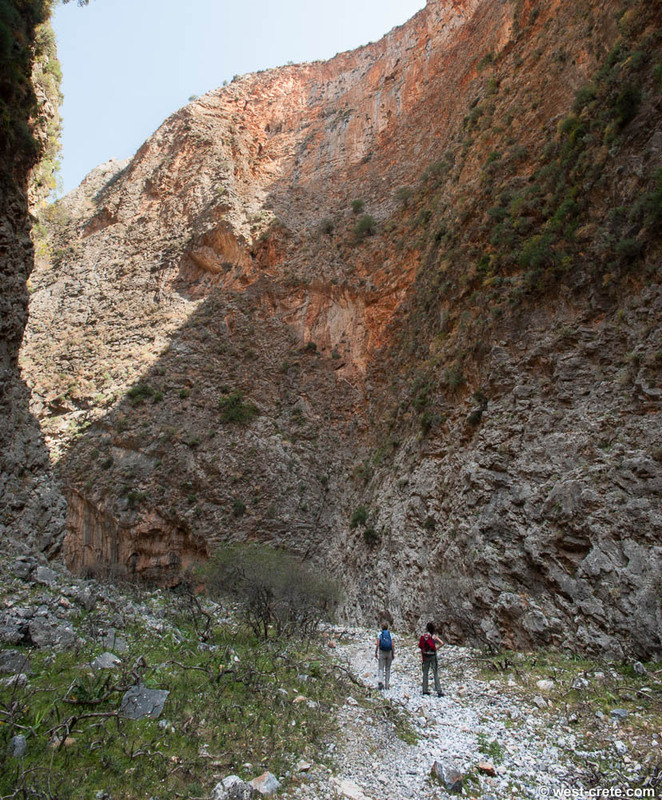 To walk safely in this gorge you will need walking shoes with a reasonable grip. 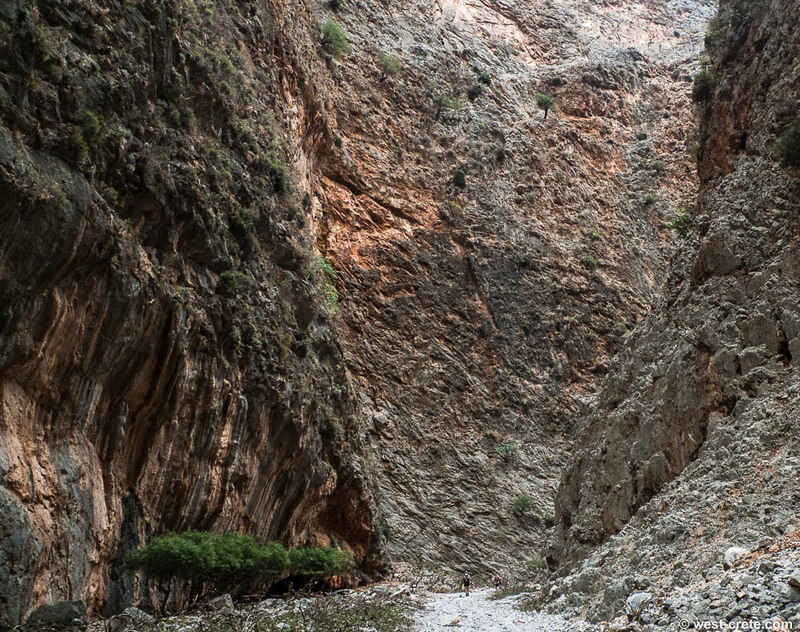 Do not ever walk in the gorge of Aradena when it is raining or has rained recently: the risk of stones falling is very real. 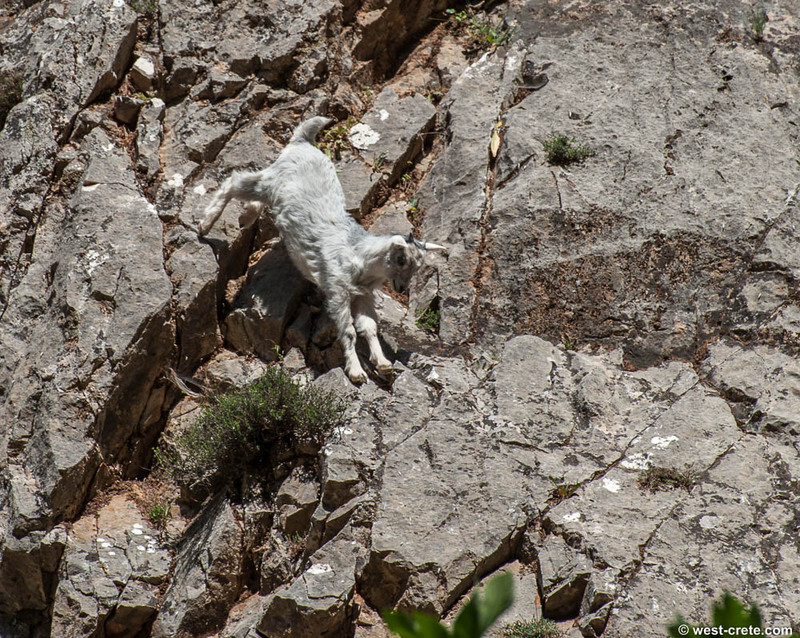 On the subject of stones, there are a fair amount of goats in the gorge (no, they are not wild!) and these have a tendency to dislodge stones. Do not pass right underneath a spot where there are goats. If you have no alternative way, wait till the goats have moved away and if necessary chase them away (by throwing stones at them, of course!). There is a small spring in the gorge but it is easy to overlook it so best take enough water for a 3 hours walk. You can get drinks and buy water at Aradena and Marmara. 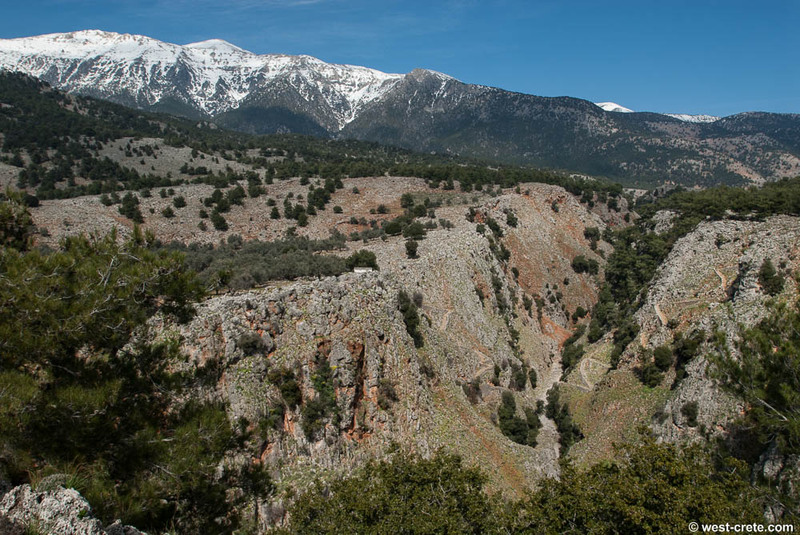 Aradena is located 3km from Anopolis and 15km from Hora Sfakion and is connected by a good road. The problem of course if you go there by car is that you will need to get back to it after the walk. 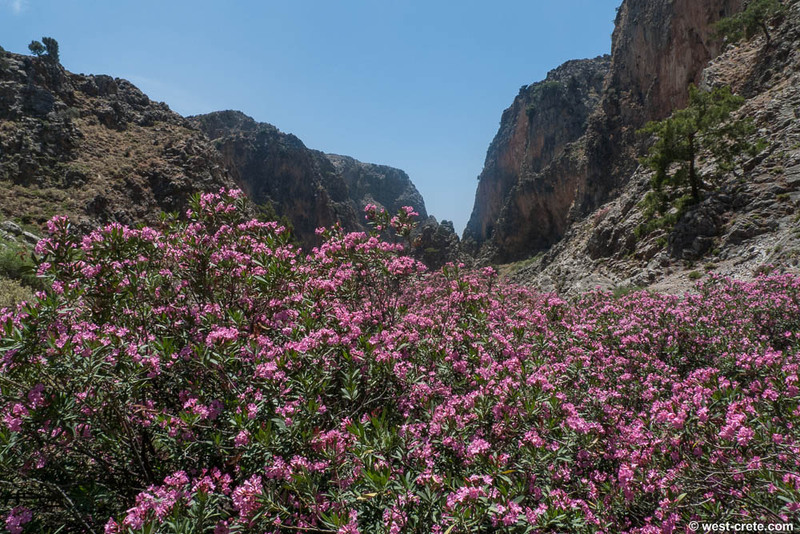 There is generally no public transport to Aradena but since 2013 there has been a daily morning bus in the summer months from Hora Sfakion to Aradena. Enquire in Hora Sfakion or at KTEL. 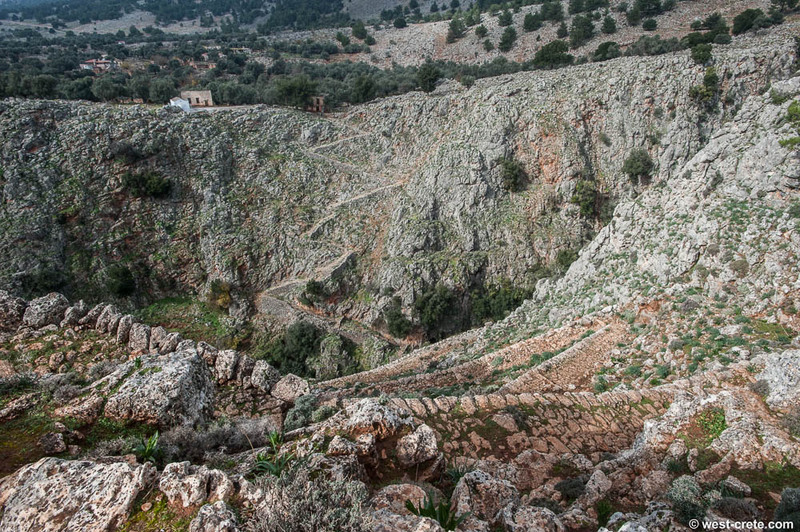 Alternatively you could get a taxi from Hora Sfakion (around 20/25 Euro) or try to hitchhike. 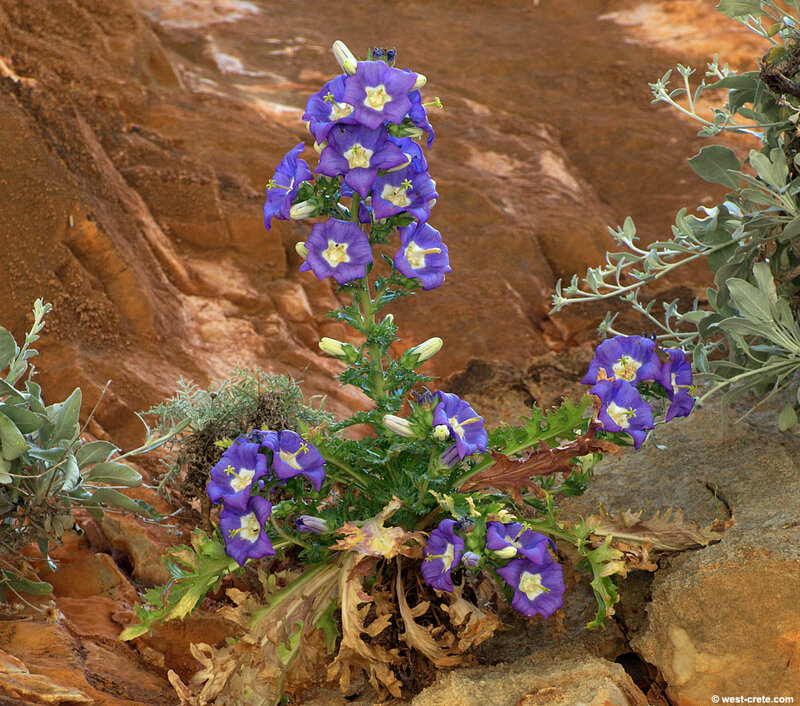 Marmara is located at around one hour walking time to the West of Loutro. The path is quite clearly marked and splits into two branches after Finix. 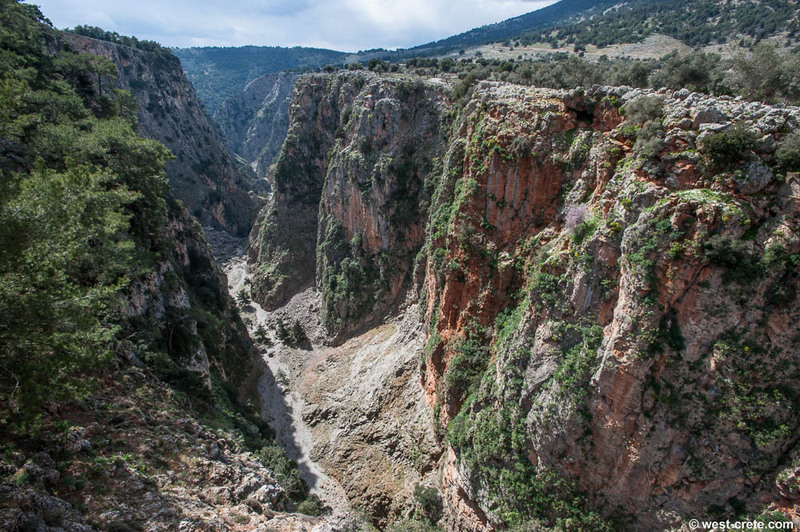 One branch descends to Lykos then traverses the cliff (more scenic but not so good if you have problems with heights), the other uses the dirt track (that leads to the village of Livaniana) for a little while before heading down towards Marmara. 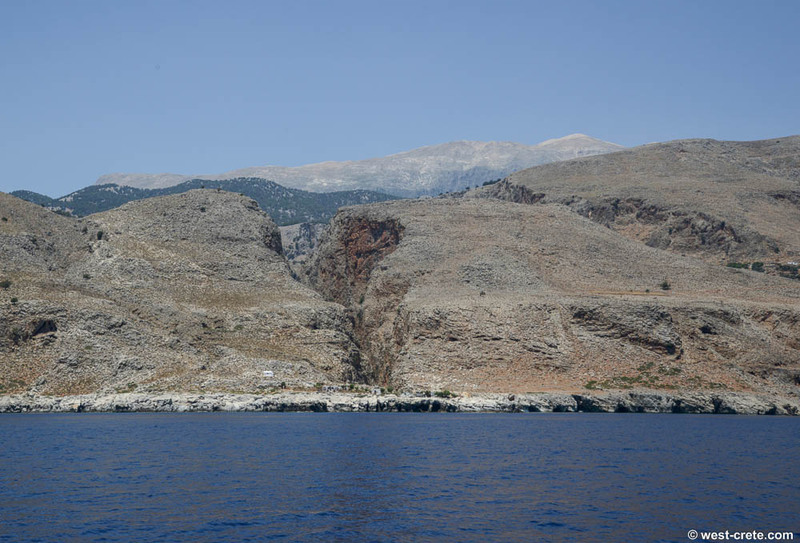 Alternatively, from May to October there is a small boat taking people from Loutro to Marmara at 11.00 and returning to Loutro at 17.00. Check in Loutro if it is running. 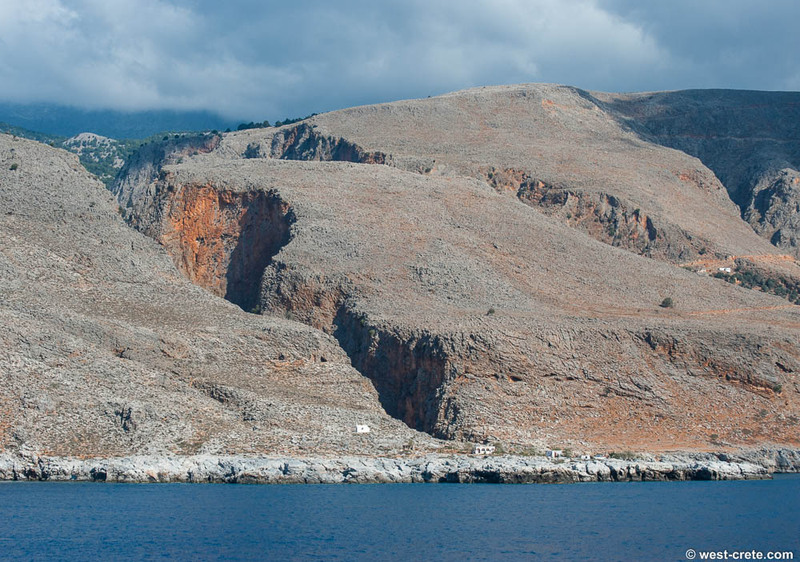 You can also arrange for a taxi boat, either from Loutro or by asking at the café at Marmara.